Business loan rates are rising which can mean large unnecessary expense for businesses, but an interest rate swap may be able to help. It’s no secret – or surprise – that interest rates, and therefore business loan rates are on the rise. On June 13, the Federal Reserve (Fed) raised interest rates by a quarter of a percentage point, marking the seventh increase since the financial crisis, and delivering the second of an anticipated three increases this year. While these may seem like minimal hikes, an increase in interest rates on a loan of $10 million or more can mean large – and oftentimes unnecessary – expenses for businesses. As such, evaluating other financing options in an environment where business loan rates are rising, could potentially save a company hundreds of thousands of dollars over the loan term. One option to consider is an interest rate swap. When used correctly, it can be an extremely beneficial tool for companies managing long-term debt. Its proven effectiveness has resulted in a significant uptick in interest rate swaps requests over the past year, and this is expected to continue over the next 12 to 18 months. This being said, interest rate swaps are not appropriate for all situations. The first step for any business is to understand what an interest rate swap is, and then evaluate it against the company’s specific needs. This will help determine if it strategically fits within the overall financial plan, and whether it will positively affect the bottom line. Essentially, an interest rate swap is a way for a company to lock in a fixed interest rate rather than have a floating rate on its loans. By locking in business loan rates for an extended period, the company reduces its exposure to fluctuations from rising interest rates. This is most effective for companies that take out long-term loans – think five, seven or 10 years – in large amounts, usually more than $3 million. Who can benefit from a swap? As this trend in interest rate swaps continues, more companies are looking at how they can hedge risk with their loans over the long-term. If company debt is term-debt or evergreen working capital, an interest rate swap could hedge risk against future interest rate increases. An interest rate swap on a long-term loan can be used to fix a stagnant portion of a working capital line of credit. An interest rate swap can be used to fix the interest rate on permanent real estate debt, used to make large equipment purchases or even a stagnant portion of a working capital line of credit. 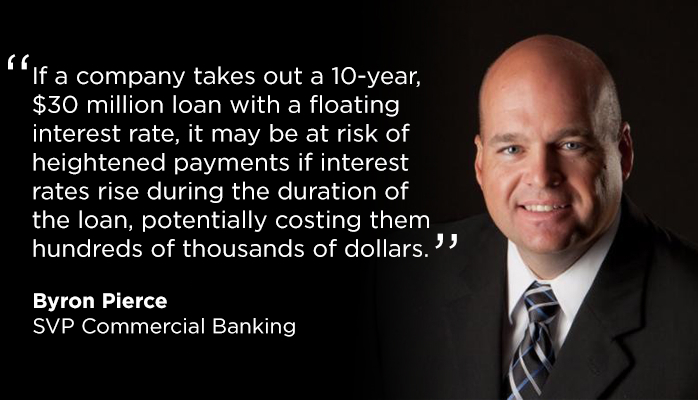 For example, if a company takes out a 10-year, $30 million loan with a floating interest rate, it may be at risk of heightened payments if interest rates rise during the duration of the loan, potentially costing them hundreds of thousands of dollars. If that company locks in an interest rate with a swap, it is guaranteed that rate for the duration of its loan, regardless of future Fed interest rates increases. What are the downsides of an interest rate swap? Interest rate swaps are not for everyone. This type of product is best suited for a sophisticated customer who understands the potential risks and rewards, such as repayment penalties or accounting needs that can arise. Companies should talk with their lender about this product before entering an agreement. There can be expensive prepayment penalties associated with these loans. The best place to start when considering an interest rate swap is with your financial team. They can evaluate your overall needs, compare and review all options, and outline the potential risks and rewards for your particular situation. Byron Pierce is senior vice president of commercial banking at UMB, and leads a team out of Springfield, Missouri. Following a brief stint in telecommunications sales, Pierce worked as a credit analyst before climbing the ranks to his current role.